RANGOON — Time may or may not tell whether the United Wa State Army (UWSA), Burma’s largest and most enigmatic ethnic armed group, actually acquired five heavily armed helicopters from China in early 2013, as was reported by the military journal Jane’s Defence Weekly in April of that year. The UWSA, as well as Beijing, have been steadfast in their denials of the transaction, which, according to Jane’s, included “several Mil Mi-17 ‘Hip’ medium- transport helicopters armed with TY-90 air-to-air missiles.” A UWSA spokesman, Aung Myint, lashed out at foreign media, challenging journalists “to make sure what we have” before reporting on it. Earlier this month, The Irrawaddy made a rare visit to the secretive Wa headquarters in Panghsang. While our reporters were unable to “make sure” of exactly what was in the Wa arsenal, we did make one interesting discovery. On the road from Panghsang to Mong La, we found the secret garden. In the distance we could make out one helicopter, one airplane and one watercraft, draped in wild weeds and ferns. After a bit of online digging, we found photos floating around on social media offering a closer glimpse of the park. 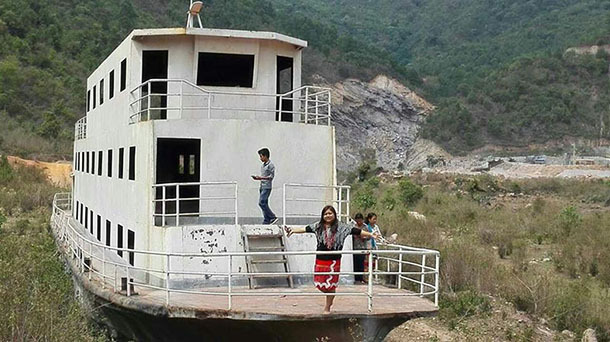 Facebook user Yex Nang Song Nyi Nyi, an ethnic Wa woman, shared the above three images, revealing that what was described as a submarine was actually just a commuter ferry. “People said the Wa [military] has airplanes,” she told The Irrawaddy. “This is not true; it has broken planes to build a museum.” The run-down relics, located near a zoo in the Mong Pawk Valley, have become a popular destination for families out on a weekend trip with their children. Wa leadership maintains that the UWSA has not upgraded its arsenal with Chinese anti-aircraft hardware, and that its recent purchases were made with the innocent purpose of providing a public park where Wa children can play and learn. Pressed further on the issue, San Khun said only that journalists were free to ask him about development, or the forthcoming anniversary of peace in the semi-autonomous region, but all other issues were beyond his domain. Wa Special Region occupies two territories in eastern Burma’s Shan State, one on the border with China, the other touching Thailand. The region’s army, a splinter group formed amid the dissolution of the Communist Party of Burma, is the country’s largest ethnic armed group with an estimated 20,000 soldiers. The remote and secretive region has been the subject of much speculation regarding its military capabilities. Experts and members of other ethnic armed groups have long claimed that the UWSA had amassed a powerful arsenal equipped with air-to-air and air-to-surface missiles as well as armored vehicles and tanks. Adding to the UWSA’s notoriety is its reputation as a narcotics trafficking organization. While the group claims to have eradicated opium production within its borders as of 2005, it is still listed as a trafficker by the US Drug Enforcement Agency, and is widely believed to be involved in the movement of both opium and methamphetamines. Eastern Burma is home to one of the biggest drug production and trafficking operations globally, and is still the world’s second largest source of opiates after Afghanistan. The UWSA reached a ceasefire agreement with the Burmese government in 1989—which has held for the past 26 years—but the government never granted Wa the autonomy it sought from peace, regarding it rather as a region within Shan State. Throughout the ceasefire period, the UWSA has maintained its military strength and its close ties with China, which some experts believe to be safeguards against a possible offensive by the Burma Army. 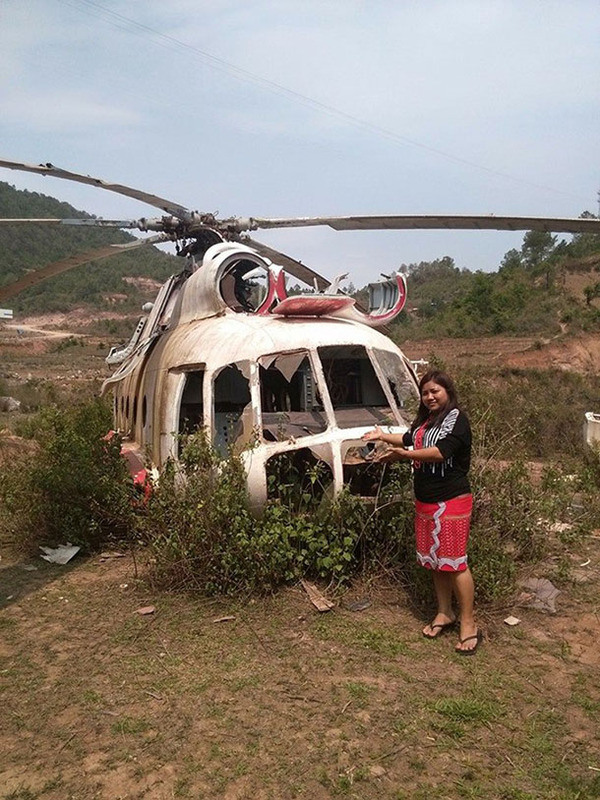 Whether the dilapidated military hardware merely serves as Mong Pawk Valley garden ornaments or is indicative of more militant intentions, one thing remains clear: The Wa Special Region will remain fertile ground for all manner of speculation and rumor.